One of the oldest structures still standing in the Town of Grand Falls-Windsor, Harmsworth Hall has served the community for almost 60 years. Influenced by the neoclassical style, Harmsworth Hall has an attractive façade and decorative brick work. It was constructed by the Anglo-Newfoundland Development Company (AND) in 1929. The AND Company was one of the most important companies in Newfoundland in the early part of the 20th century. It was largely responsible for the development of Grand Falls as a town with the creation of a pulp-and-paper mill. The company named the hall after one of the original owners of the mill, and for decades it served the community as a theatre, playhouse and meeting hall. The Town of Grand Falls was officially incorporated in 1963, and the company gave the building to the new municipality as a town hall. Since then, the city council has renovated the interior to include offices and council chambers. 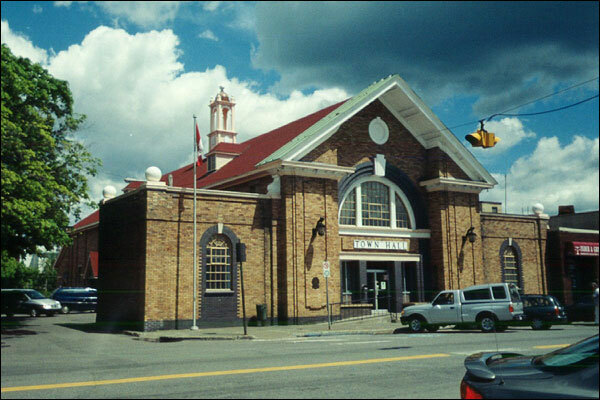 The hall still operates as the offices for the Town of Grand Falls-Windsor. The hall has a wood frame with a brick exterior and stands two storeys tall. It has roof trim moulding, copper flashing and large arched windows that overlook High Street, the main street in Grand Falls. It has concrete lintels over the doors and windows, and the centre portion of the hall features a peaked roof. Harmsworth Hall became a Registered Heritage Structure in 1998. It is one of very few heritage structures in central Newfoundland. Also view Harmsworth Hall Registered Heritage Structure on the Heritage Foundation of Newfoundland and Labrador web site. The Newfoundland and Labrador Heritage Web Site has on its site only a portion of the registered heritage structures in Newfoundland and Labrador. To view a complete list or search for a particular structure visit the Heritage Foundation's Property Search page.